Marina's Craft Space: The Girl Friday Mystery Reveal Blog Hop! 12 amazingly talented designers are joining the CAS-ual Fridays Challenge Team! We have been sworn to secrecy for the past few months, and today we finally get to spill our beans! OMG! It was so hard to keep it a secret. I'm so blessed to be chosen to be a part of this awesome team. I was participating in a number of challenges at CAS-ual Fridays and it was the first challenge that I won something. It's something I will never forget and being on the team is so special to me :) This is a card that I've made specially for this hop. We could just make a regular old team announcement, but that wouldn't be nearly as fun as a mystery blog hop filled with awesome creative inspiration, clues and prizes...would it? To join the fun, you'll need to start at the CAS-ual Fridays Stamps blog where you will be given the link to meet the first Girl Friday and collect your first clue. Then continue through our mystery blog hop, meeting the team, gathering clues and leaving comments along the way for your chance to win prizes! At the last stop on the hop, you'll have one more chance to win a prize by using the clues you've gathered to solve the mystery. The hop ends at noon on December 27th. Leave a comment on this post to win a $15 gift certificate to CAS-ual Fridays Stamps. If I'm the first blog you visited, you could start at CAS-ual Fridays Stamps blog where the first clue will be at. 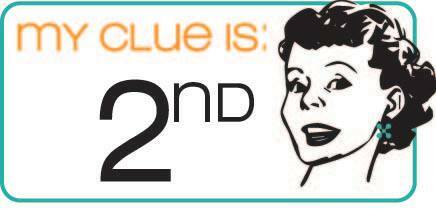 But if you've been hopping from the start, you'll now hop to the next link ( CLICK HERE ) to find out the next Girl Friday and clue. Have fun! And catch you next time! Marina I really Love all of the elements of this card, but yet it is still CAS!! Great Job! You rocked it!! Fun sentiment - Congratulations on the new gig! love this card -- I guess we'll all be doing valentine cards soon! Wonderful card. I'm never brave enough to splatter but it always looks so good. CONGRATS! Love your CUTE card. Love how you continued the sentiment on the little heart. Thanks for sharing. Fabulous card!! And a big congrats!!! Love this - the watercoloring is fabulous! Congrats on the new gig! I love the idea of stamping part of the sentiment on the smallest heart, such a cute card in great colours! Congratulations, Marina! The card is so cute. Love the colorful stacked hearts. Well done. Congrats, Marina! Well deserved...I adore your little hearts on this ca-ute card! Such a pretty card! Congratulations! Congrats to you on your new DT! Well deserved! Your CAS card is beautiful! Looking forward to seeing more from you! So happy to see your are now a Girl Friday! Congrats!!! Your card is absolutely gorgeous! Oh my gosh, this card is super cute. I love that your heart is all pastel, and then that black arrow just pops! And that your sentiment is on the arrow, but also on that little heart. Love the inlaid hearts. Congrats on joining the team! Your card is CAS perfection! Congrats on the DT. Adorable card! Congrats to you! Your card is adorable! Love the repetition of the hearts! Congrats! love this so much! congrats! I love this card! Congrats! Gorgeous card! Congrats on being a Girl Friday! Love the hearts. Looking forward to seeing more from you. Love love this card, will have to remember it to try myself one like it. Congrats on joining the team. That card is so clever...true, I already love the die but I really love what you've done with it. Many congrats. What a sweet heart card! Congrats on joining the DT! Congrats on becoming a new Girl Friday, Wonderful multi colored heart card! Congrats! Love your sweet card. Congrats on being a Girl Friday! Very pretty card! Welcome to the team !! Very cute card !! Wow! This is amazing! Love the colors and how you layered the hearts! Great card design with the arrow going through the hearts. How fabulous for you to now be on the DT where you won your first challenge! Congrats - and your card is awesome! Great stuff! I love the layered hearts. Not too shmultzy. Congrats on making the team! Great card, I love this sentiment. Congratulations. Very cute card. The sentiment made me giggle. This is just gorgeous - I love the touch of pink in the middle! Congrats, I love, love love your card, it's my fav! Are you a fellow Grey's Anatomy fan:) Thanks for sharing and the chance to win. Congrats!! I see that you are getting on several teams in the New Year!! Good for you! :) Your card is just darling and I love your design!! Thanks for sharing! Congrats on joining the CAS-ual Fridays team (and EXTRA congrats on being a newlywed); an honour well-deserved as your creativity is amazing. Thank you for sharing your gorgeous card; looking forward to more inspiration in the New Year. Merry Christmas! Super cute card! Love the layered hearts. Wonderful card. Love the layered hearts. Congrats to you! Love this cute heartfelt card with the splattered background! Congratulations on being a Girl Friday. Gorgeous, gorgeous card. I love everything about it. Looking forward to seeing more of your work. Congratulations! Love the bright fun colors you used. Awww . . . how cute! Such a fun sentiment, too. Marina, congratulations on your new DT assignment! Great card with fun and cheery colors. One can't ever go wrong with hearts. Congratulations Marina :) So happy to have u on CFC team !